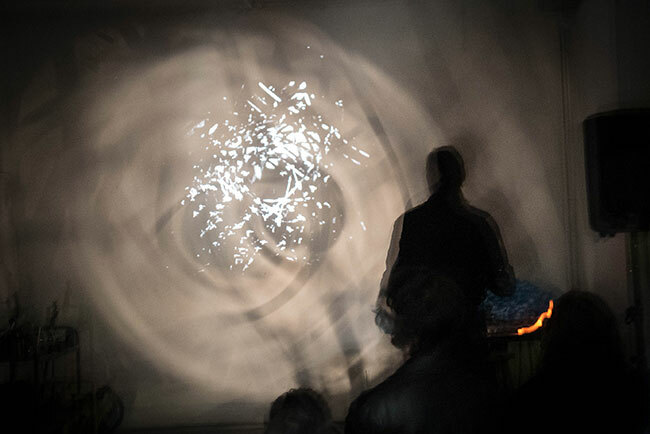 The expanded cinema performance Pattern/Chaos is a negotiation between the unpredictability of organic processes and the regularity of frames, optics and motors. Images that are at first glance perceived as abstract turn out to be concrete precipitation from phenomena that surround us in every day life. The work can be understood as an attempt to undermine the assumption that the natural world and the human world are opposites. Moving images on celluloid are made aided by salt, moss, branches and grass. Kinetic and shadow objects made from found and recuperated materials are used to break-up and expand the film-frame and create an environmental experience. Field recordings registered in a tropical rainforest are employed to create an immersive soundtrack.